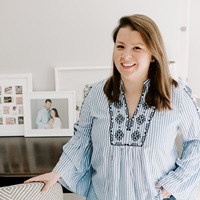 There are two things that have made us ripe targets for a friendly “pop-by” this summer: 1) Living close to the beach, and 2) Having a cute baby that family wants to visit! I actually love a surprise pop-in from friends and family, it was one of the things that I’ll always cherish about my own childhood. We grew up with a well-known open door policy that meant people would stop by for dinner or drinks on any given day of the week, and my mom always graciously popped a bottle of wine and added an extra place setting to the table. 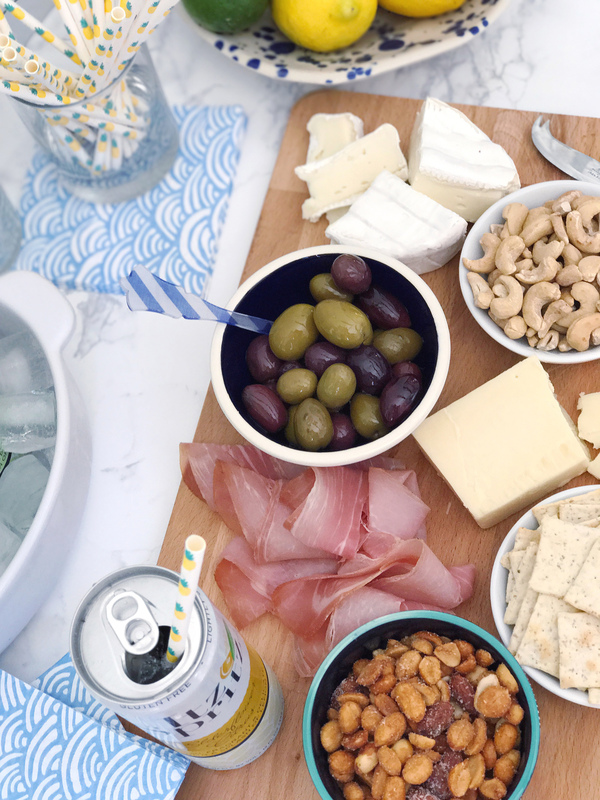 She also taught me that having a few items in your pantry kept you prepared for any entertaining surprises; my mom can always assemble a cheese plate with the snap of her fingers at a moment’s notice! 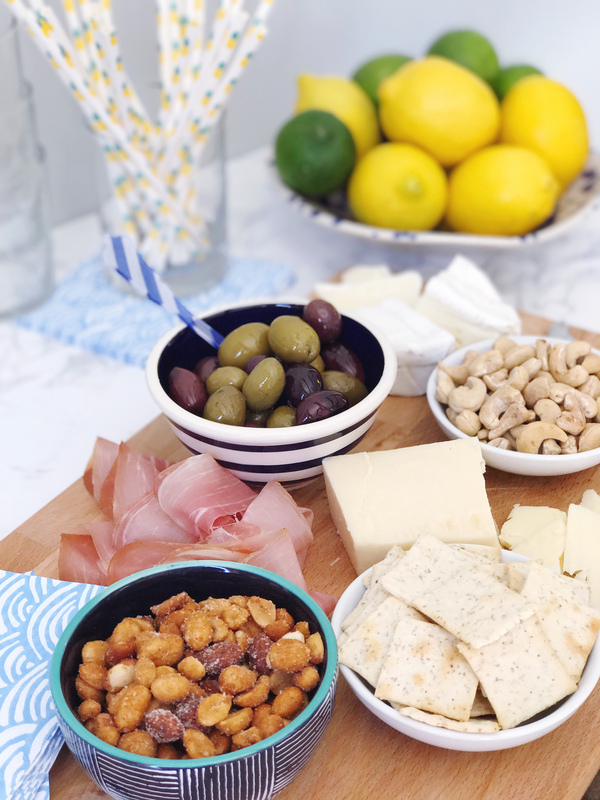 I thought I’d share a few of my entertaining pantry essentials that I always have on hand for last-minute entertaining and surprise guests! Easy Snacks. Crackers and nuts are pantry staples at our house, we always have some tucked into the cabinet and are the foundation for a last minute cheese plate. We typically keep a few blocks of cheddar cheese in our fridge on the regular for stirring into eggs in the morning for breakfast, and it’s one of the most agreeable cheese options for a cheese plate. I also typically have some olives in the fridge for salads and jams for toast that make easy and tasty additions to a snack board. Dry dip mixes are also a key item in my pantry, add in a little bit of sour cream or mayo from the fridge and pull out any leftover veggies and some crackers and you have a crudité plate in minutes. Simple Drinks. 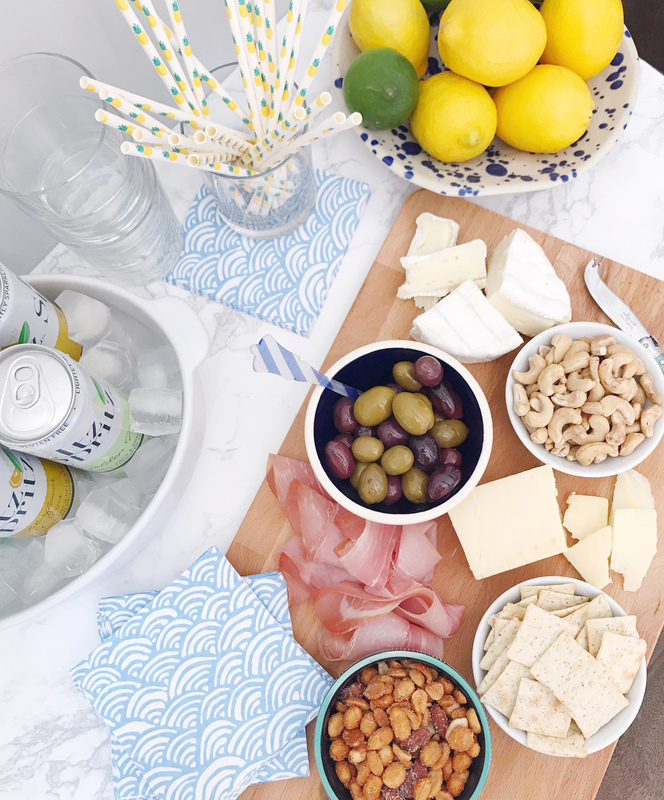 I keep several bottles of sparkling water on the shelves in our kitchen – they’re super cute décor and make for a universally appealing non-alcoholic drink to offer guests. Most weeks in the summer I keep a bowl of citrus on the counter and can squeeze some fresh juice into the glasses. A stocked bar cart is a luxury to have, but for last-minute entertaining I don’t want to spend a ton of time scheming up cocktails. Keeping some chilled drinks like Itz Spritz alcoholic-spritzers in the fridge are a perfect solution though! Anytime you can cut down on prep-work and cut right to serving and chatting with your guests is a good choice in my book. 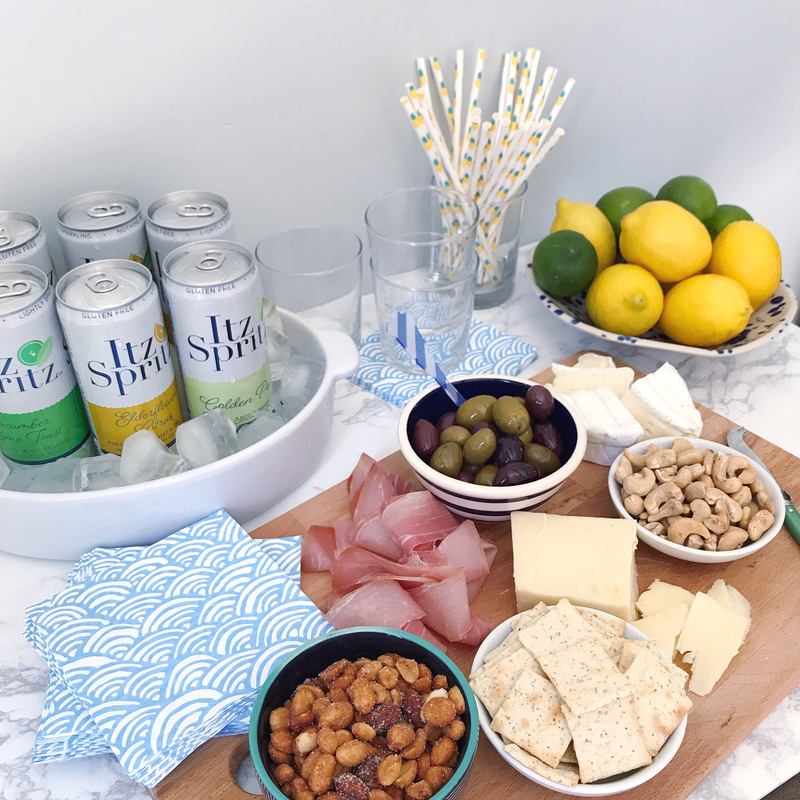 I just pour them over ice and pop in a festive paper straw and they’re ready to serve (plus they have really tasty, unique flavors: cucumber lime twist, golden pear, and my favorite the elderflower citrus, yes please!). Pantry Party Supplies. I have a borderline insane addiction to collecting party supplies, so I’m always prepared with seasonal cocktail napkins and festive straws to match my drinks and appetizers. If you don’t collect party supplies like I do, a nice set of linen cocktail napkins on your bar is a great evergreen solution that you can use year round. We also have a ton of specialty glassware for every type of cocktail you can imagine, but some simple, versatile low tumblers are my favorite glassware to rely on for casual entertaining – they’re always clean in our glassware cabinet for quick access! 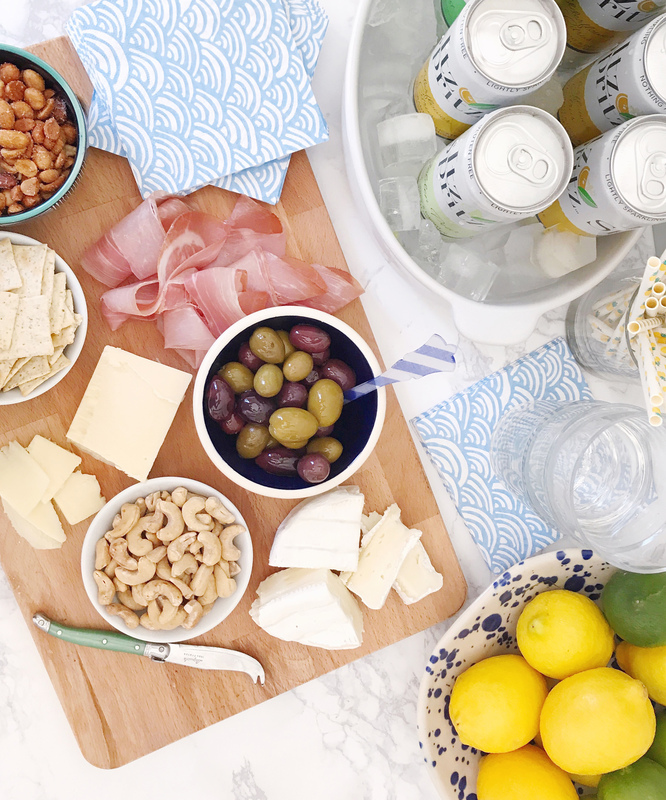 For last minute entertaining, it’s all about keeping things easy, casual, and welcoming. Do you have any pantry-staples you lean on for surprise guests? Share them with me in the comments! 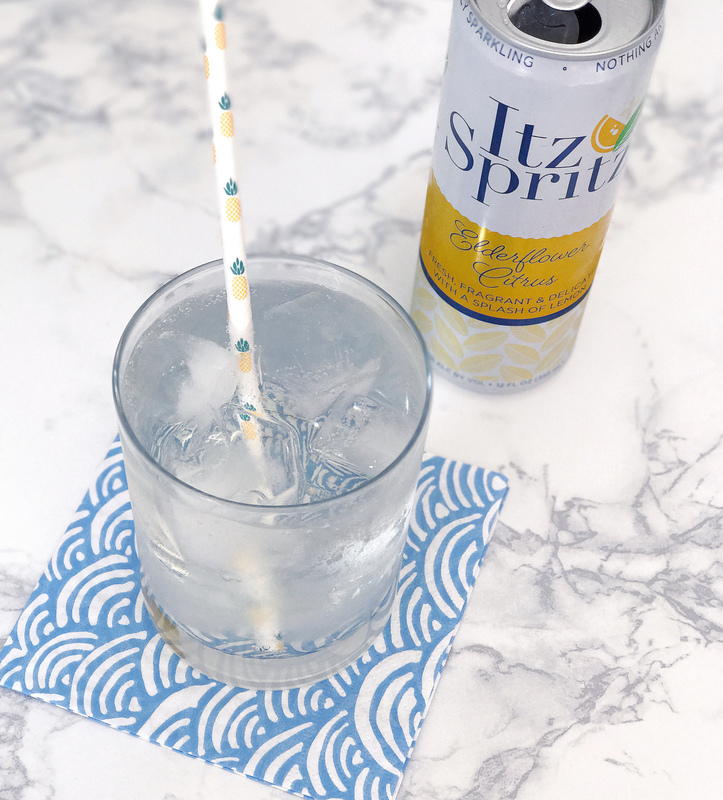 Please note: This post was created in partnership with Itz Spritz. All opinions, images, and content are my own. Thank you for supporting brands that support this site! Master Bedroom Makeover. Traveling with Baby. 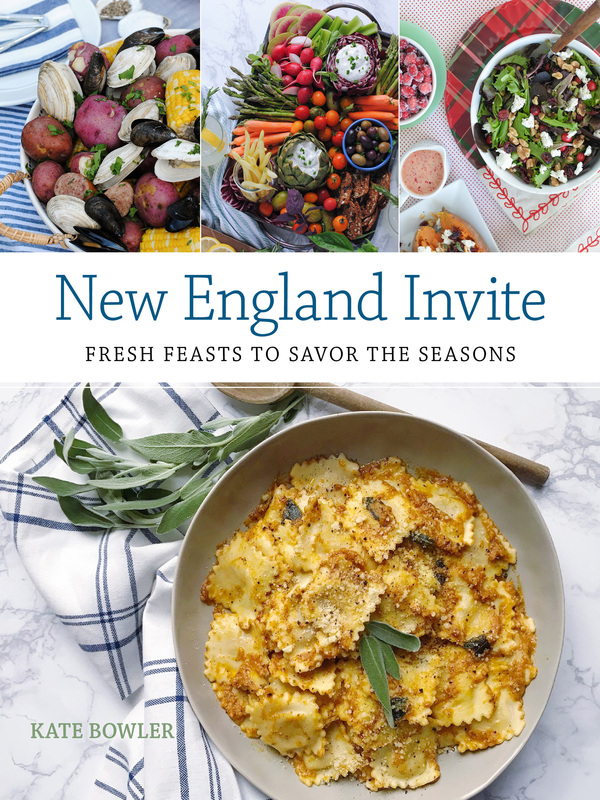 One Response to "Last-Minute Summer Entertaining." Love these tips! I am usually prepared for the drinks and cute napkins (as a fellow collector 😉 ) for last minute gifts, but I feel like I never have the right food on hand! Probably because I can’t resist cheese and would eat it all myself before any guests arrive haha! 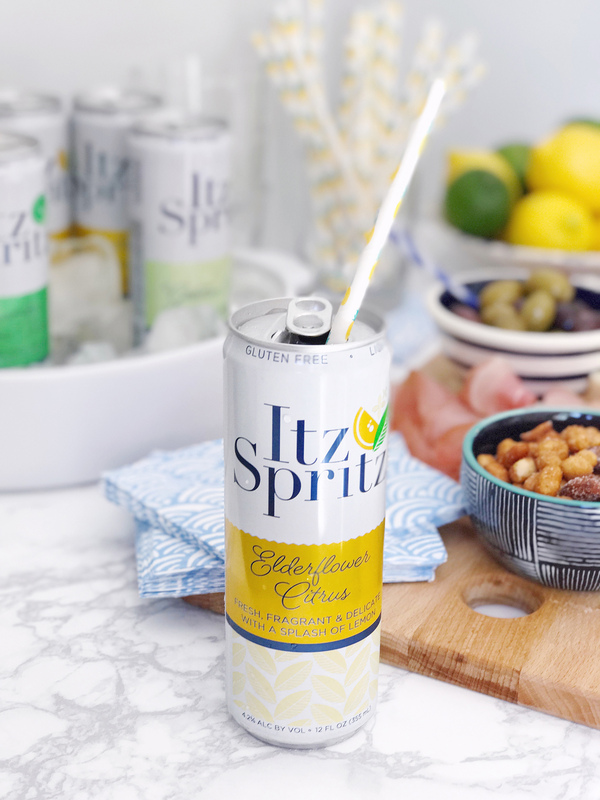 Love how you are serving Itz Spritz too- so yummy!